I'm so excited I can hardly type. After talking about it for six months now, we finally board the long-haul flight for Paris tomorrow! I had the day off today, and instead of packing, I spent the afternoon gathering ingredients for this classic French dish. And in the spirit of vacation/indulgence, I ate it all by myself at 3:30 in the afternoon. It made me so incredibly happy—one of the simplest, most delicious dishes I've made in a long time. Make it as soon as possible! As Anna from the Coffee Break French podcast series would say: à bientôt! Bring all but the last two ingredients to boil in a 10-inch deep saute pan. Boil for 2 to 3 minutes to evaporate its alcohol and to reduce its volume slightly. Add the mussels to the pan. Cover tightly and boil quickly over high heat. Frequently grasp the pan with both hands, your thumbs clamped to the cover, and toss the mussels in the pan in an up and down slightly jerky motion so the mussels will change levels and cook evenly. In about 5 minutes, the shells will swing open and the mussels are done. 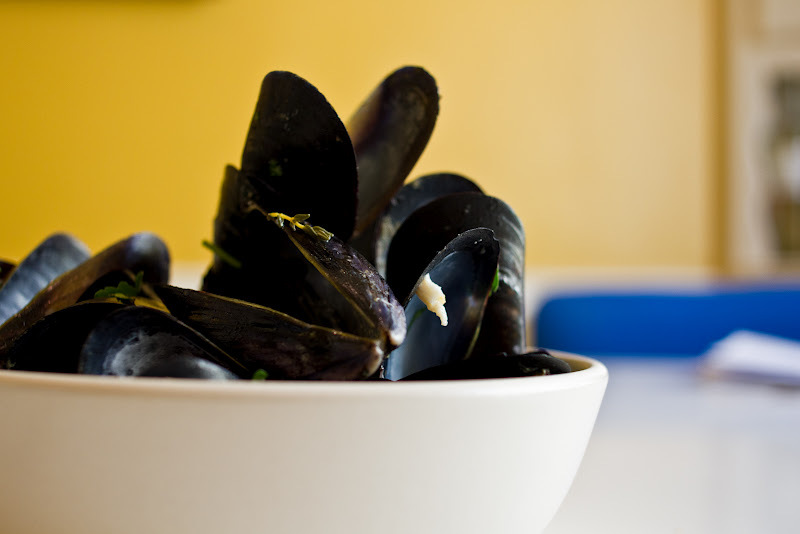 With a big skimmer, dip the mussels into wide soup plates. Allow the cooking liquid to settle for a moment so any sand will sink to the bottom. Then ladle the liquid over the mussels, sprinkle with the parsley and serve immediately with nice French bread and butter. What a lovely, lovely poem (from Sut Nam Bonsai)--thanks for sharing the link! Have a wonderful time in Paris. We'll be eagerly awaiting a trip overview! I hope to make it there this fall, having not been there in over 8 years. Wow, time flies. 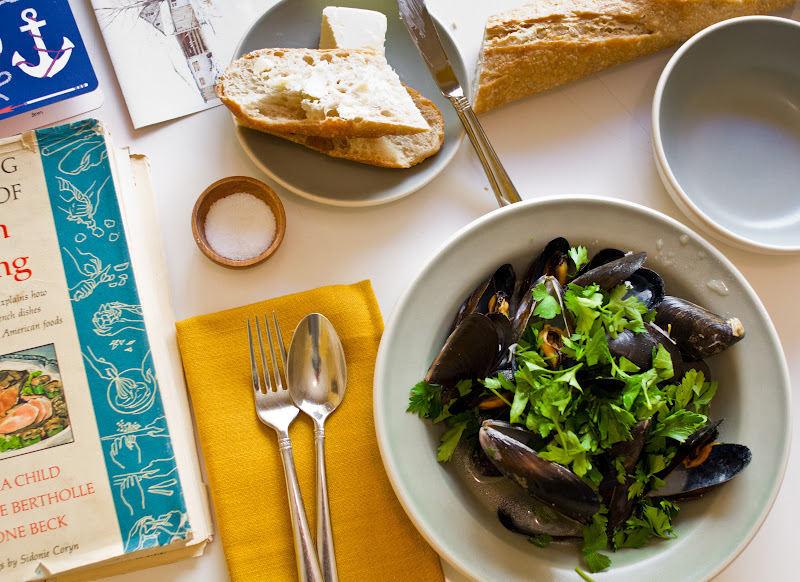 did you know i made mussels this weekend with mussels we picked on the beach? i don't think i had a chance to tell you about our seafood bonanza! oysters, mussels, clams, all foraged from the shore! the mussels were my favorite. they were very similar to this recipe. that white wine broth? geeeez! i drank it straight from the bowl when i ran out of bread! bon voyage! ciao! tu me manques! Have the best time! I absolutely can't wait to read all about it and to watch your Paris video! 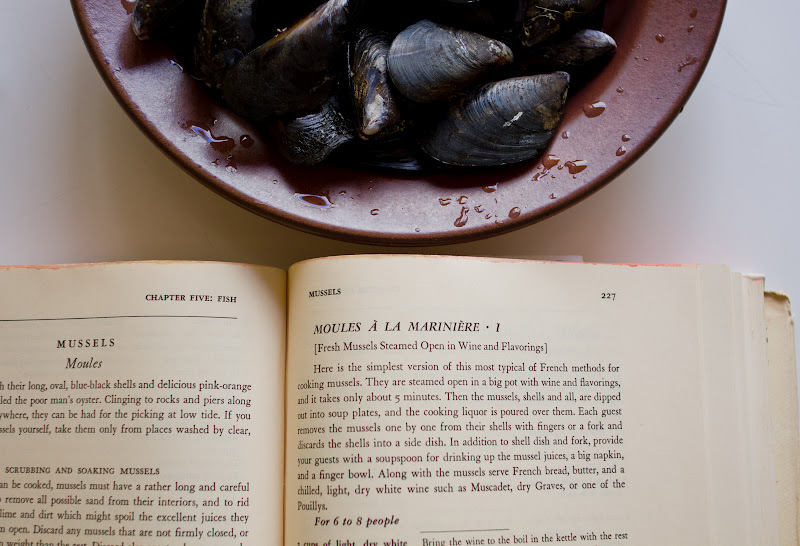 I love moules marinières--so easy, so good, so weirdly impressive to guests for some reason. :) Lucky you, going to Paris--have a wonderful time! You listen to Coffee Break French too? Every time I read this blog it feels like you're someone with whom I've already met and had rambling conversations. Anyway, whenever I mention to someone that I'm slowly learning French from Scottish people, they ask if my resulting French must have a Scottish, rather than American sounding accent. Probably... guess I'll just assume it adds a "wee" bit of charm or an aura of mystery. Bonnes vacances! Can't wait for this video. It will be like Berenstain Bears books...Berenstain Bears Go to the Doctor, Berestain Bears Go to School, Berenstain Bears Go to Paris! When I saw the title of this post in my reader I dropped everything and headed right over- I love love love mussels and this looks so good! Have a wonderful, magical time on your trip! Have fun guys! Also, I'm totally making this and then sitting on our balcony and getting drunko. I owe you a big thanks - this post pulled me out of my culinary rut. I haven't enjoyed a meal this much in a while, so thank you. Have a lovely voyage you two! Enjoyed the recipe....Just got back and had some authentic French cuisine such as this one. Try to go to the Latin district...there are some unique restaurants..with some equally unique, authentic French dishes! I just noticed your silverware is gorgeous! Is it vintage? Have a great trip and come back and show us lots of pictures of food! PS what's in the pill bottle? Something fun? Have an amazing time! My favourite restaurant in Paris is called Firmir Le Barbier and it is run by two old French men. One is the cook and one is the waiter. It is a ten table restaurant and everything is so fresh and amazing. Suprisingly is isn't overly expensive considering it is a few blocks away from the Eiffel Tower. (or Le Tour d'Eiffel. 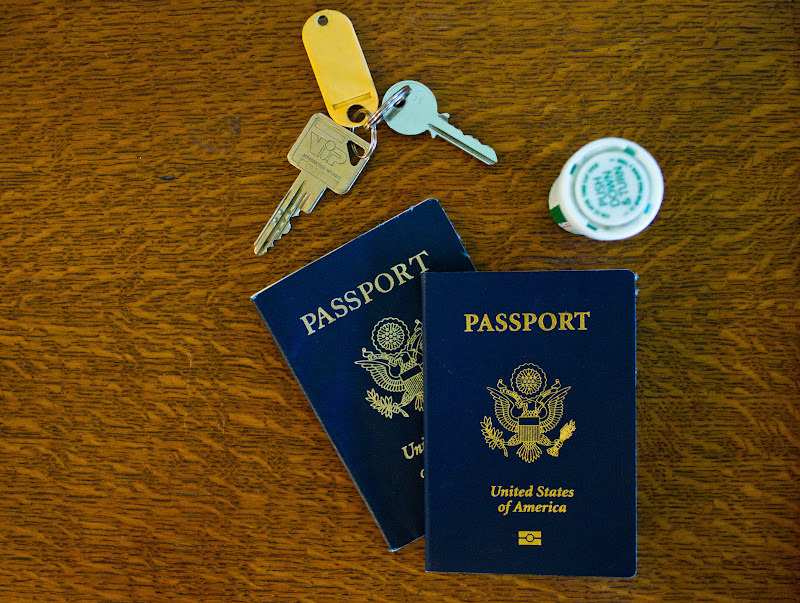 )Bon voyage! Thanks for all the recs, friends! You guys are great. right?? It was soooooooooo good. So glad you tried it!! Amelia! This is so funny---I literally *just* (as in, this morning on the train) finished Julia Child's My Life In France. So fitting. Have so much fun. I love that city too, too much. Hope you´re enjoying Paris and your Saveur nomination. You so deserve it. I just voted for you. Enjoy, enjoy, enjoy! Have fun in Paris! I have now been twice and loved it dearly. Sadly I've never had the money to really experience the cuisine there, I usually fast-food it when I travel to save my money for the sights. I am jealous, say hi to my city for me! Mom and I made these last night! Except we had all different herbs... chives and cilantro... oh well. They were still AMAZING. I would definitely suggest to anyone who makes them to really be sure to toss the mussels in the pan so they cook evenly. I didn't do that very well and we had some undercooked ones that barely opened. We just put them back in the pan with a bit of water, let them steam for another minute or two and they cooked perfectly. It's so great!What a lovely poem!Hope you enjoy your time in Paris!